Turkey- Executive Secretary of BMKG, Dr. Widada Sulistya representing Director General of BMKG attended the 1st International Panel for Director General of Meteorological Services of Islamic Countries, in Istanbul, Turkey from 10-11 Mei 2017. 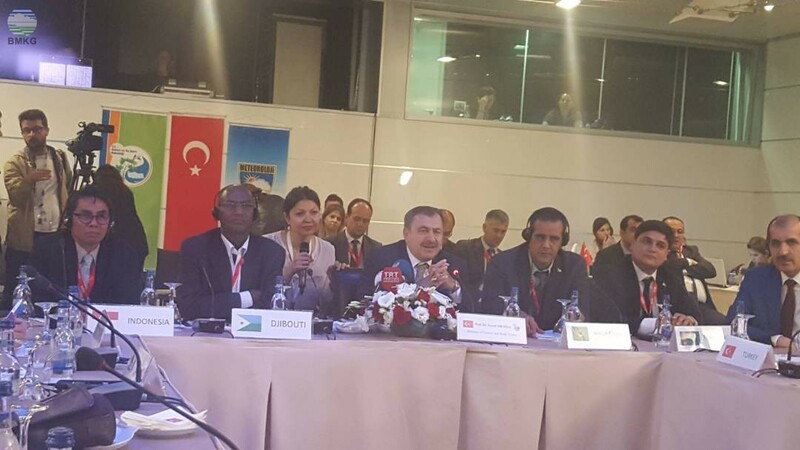 This international panel, which was opened by the Turkey Minister of Water and Forestry Affairs and attended by 25 Director General and representative of Meteorological Services of Islamic Countries, conducted as a part of the 4th International Water Forum in Turkish with "Water and Peace" as theme. The purpose of this international panel is to increase solidarity and establish cooperation in the field of meteorology among Muslim countries, as well as to increase their capacity building in various fields. Executive Secretary of BMKG as Indonesia representative, submitted a proposal related to improving the quality of meteorological information services both regular as well as in form of early warning. He also emphasize about the important of increasing the capacity of human resources to improve the quality of meteorological information. This can be done through training, workshops and joint research in the field of meteorology and climatology. Executive Secretary of BMKG also confirmed that Indonesia, as one of the WMO RTCs, is ready to provide training place for the members.